We at Airflow Appliance Repair are very proud of the quality of our work, and we want to make sure your appliances run trouble-free for a very long time. In order to accomplish this, we offer one of the most comprehensive warranties in the industry. 5 years limited warranty on major parts. Labor warranty 30 days. If your appliance has any other problems within 30 days from the day of original repair, we promise to fix it with a 50% discount on labor for the second service call. We want our customers to be satisfied, so our promises will be put in writing on the invoice as a document for future references. We have live operators standing by 7 days a week to explain our policies and warranty terms. We are also proud to say that we only use parts manufactured by American companies. This ensures that you get high quality parts with the lowest risk of defect, which increases the chances that your appliance will work problem-free for years to come. 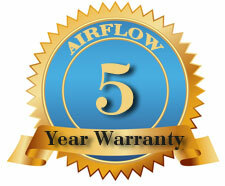 Call us or book your appointment on the Internet so that Airflow Appliance Repair can prove	that we provide the best service possible, and we make sure our warranty reflects that.